The Elisabeth Hasselbeck Screech Owl is a small, loud, opinionated Owl of the Species vociferor conservativus, indigenous to the United States’ Right-Wing regions. 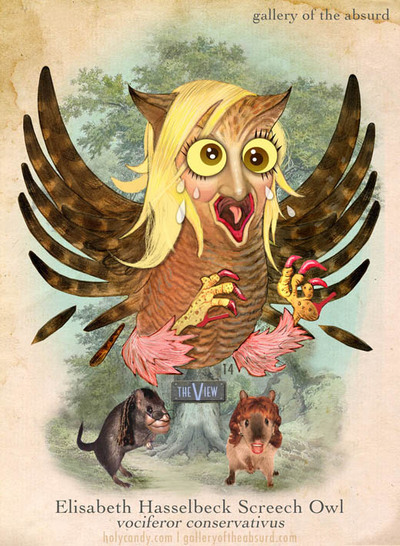 It is a bleached-blonde Owl that sits erect and is always prepared to tearfully defend its territory should any creature attack the Bush Administration or theistic evolution, or question the Iraq War. The Screech Owl’s feathers are easily ruffled; however, recent field reports indicate the Owl is capable of graciously cooing, rather than screeching, at the most unexpected times. This is the first time the Owl has been known to eat post-election crow. The Owl was first spotted in the Australian Outback, where zoologists originally called the cute bird a “Survivor Sweetheart.” Now living in New York City , the Owl migrates to Republican events across the country during election season. Most owl species depend on camouflage, stealth and small animals to survive, but the Marc Jacobs-clad Elisabeth Hasselbeck Screen Owl seems to defy all the conventional owl wisdom, surviving on a diet of FOX News, Rosie blood and egg white omelets with spinach. The Screech Owl’s only natural enemies are its co-hosts and liberals. Medium: Acrylic on paper, digital paint, photoshop. Concept created by GOTA and Holy Candy. Latin name and description written by Candy Kirby. My talented artist pal, Charles "Chuck" Frazier sent this drawing to me a few months ago - I think it's high time I posted it. 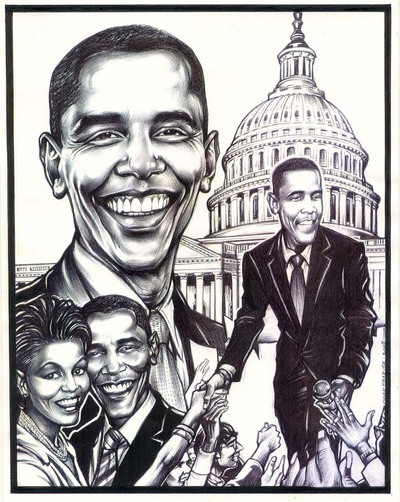 Congratulations to President-Elect Barack Obama.